As he sasy in the article, he is aware of other solutions but they dont fit his requirements for simplicity so he did his own. Personally I typically hard code my creds in code and then keep records against the MAC. Sometimes I sent out such info on serial at boot, knowing it’s secure enough since if you are reading the serial port you either own or pwn the device anyway. This indeed seems a bit like reinventing the wheel. OK so I have found myself wanting something a bit nicer than WiFi manager, but tbh it does the job. The NodeMCU boards I use have a flash button that is not used by anything. I set my projects up so that pressing the button puts it back into wifi config mode. 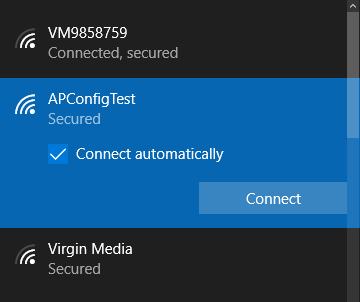 I would be interested in a write-up on using the smart config stuff with an android or ios app, no access point required and much more non-tech friendly! Exactly, though I suspect that is not safe – or is it (auth data transferred via packet length!)? For me, I am mainly interested in setting up a virgin device for the first time. I would completely disable smart config once setup or until I force a factory reset through MQTT/protected webpage/physical button. I don’t feel this would be too dissimilar to the setup of devices such as a Chromecast. I did this with corona sdk. Quite simple to use and the code to connect to esp and configure it is really simple with luasocket. But it’s not too late to fix it: just add an comparative overview of the existing implementations, alternatives (ESP config app) and if you’re after even more content, you could also expand the topic with how to catch any traffic via that network and force the browser to the configuration page (i.e. no need to know the IP). It’s Arduino code. Please put an Arduino tag, or at least mention it in the article, to let people not interested in Arduino filter this. The title of the article is literally AP configuration code for the ESP8266. That should have been enough to know if you’re interested or not. Surely you’re aware there are other OSes for the ESP? Ones that aren’t Arduino, but can still act as an AP? OK, so I was confused as well initially. This is solely for an ESP8266 that you want to configure in AP mode always- not one that starts in AP mode, then gets reconfigured into STA mode. How to include proxy settings and user credential in the program?